Today’s smoothie is more of a juice, but for the sake of Smoothie Saturdays – let’s just call it a smoothie. We’ve made this concoction several times before and keep coming back to it. It’s a nice, light change-up from our usual green smoothie. The combined benefits of celery, cilantro, parsley, and pear make this a detoxifying and cancer-fighting tonic. Click to read more about the ingredients. Celery is a powerful detoxifier. Though it is probably best known for being a “negative calorie food,” it comes with numerous other benefits. Celery is high in essential aminos, B Vitamins, Vitamin C, potassium, iron, calcium, and magnesium. Its natural sodium content penetrates the cells, allowing nutrients to be quickly absorbed by the body. It is an alkalizing food which balances the body’s pH. Sustaining a balanced pH is essential to a happy, disease-free body. Pear is one of the best fruit ingredients to use for juices and smoothies. It has a high fiber content – 6 or more grams in one medium fruit! That’s important for keeping you full and eliminating toxins from the body. It also contains loads of Vitamin C, K, copper, and iron. It also stabilizes blood sugar which helps to curb bad cravings. Both cilantro and parsley come with a list of benefits at least a mile long so let’s just highlight a few of the best. One particular benefit that they share is a high concentration of antioxidants – you can use less of them in a smoothie or juice than you would a regular green and get as much or more benefit out of it. Parsley is packed with chlorophyll which stops the growth of bad bacteria [it’s even used for curing bad breath!]. It’s a powerful antioxidant, anti-inflammatory, and diuretic which means it removes toxins from the body. It is loaded with Vitamin C and iron – a helpful combination for those with anemia. Parsley stimulates digestion and regulates hormones as well. 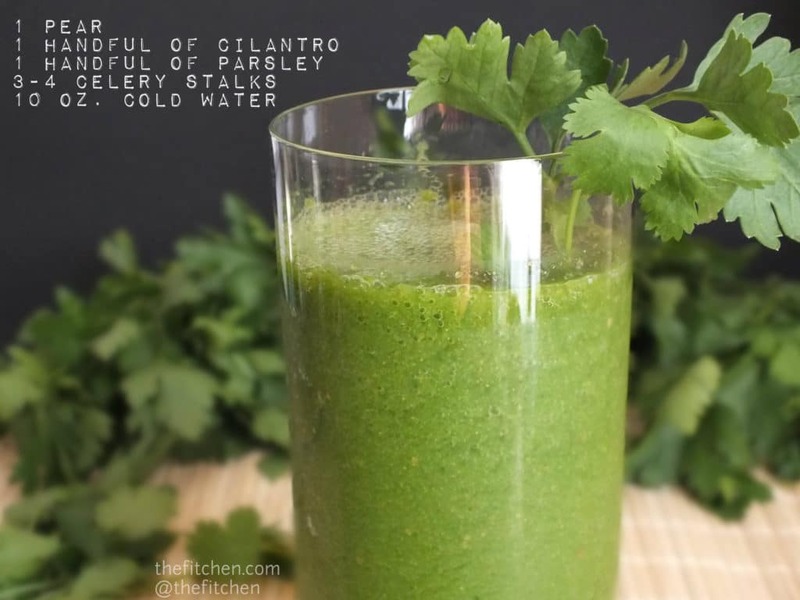 Cilantro is yet another powerhouse antioxidant and anti-inflammatory herb. It is especially effective at detoxifying the body by removing heavy metals from the cells. It has been shown to lower bad cholesterol and balance hormones. Like parsley, Cilantro also has high amounts of iron and magnesium. Tried your shake today. Added a spoon of honey to it. Yummy!!! Thanks for sharing.